I recall my first visit to Portland and hearing a very loud obvious military jet, something I was not used to in the Bay Area unless one of the local teams made the Playoffs(then they buzz the stadium). I thought to myself, holy hell what is happening?!?! Ran to the window and there they were, beauts. Four F-15’s mobbing across the city sky for no reason. Amazing! Excite! This is the kind of stuff that brings out the super excited big kid in me. Airshows have always been my favorite thing. I used to put together model airplanes(special Oregon edition), I even went to the Sierra Academy Of Aeronautics in Oakland to become an aircraft mechanic. The bottom line is, you can imagine how excited I was to hear and see these beasts over Portland. Little did I know at the time, it is a very common thing to see fighter jets over Portland. So I looked further into it and brought you this information as to why you often hear military jets flying over our lovely city. I got the idea because I always see people posting in Facebook groups asking why there are jets right now(they don’t know how to research). 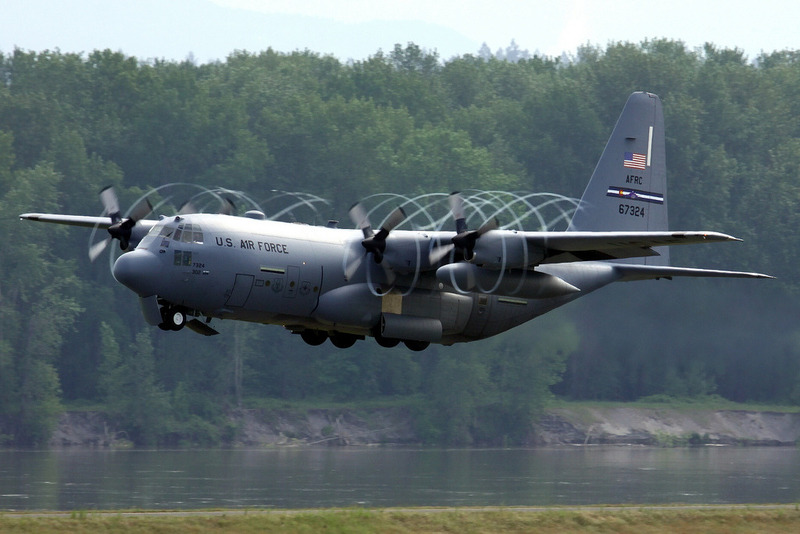 What Military Planes Fly Over Portland? Those jets over Portland are McDonnell Douglas(currently Boeing) F-15C Eagles. A classic Air Force champion of the sky. 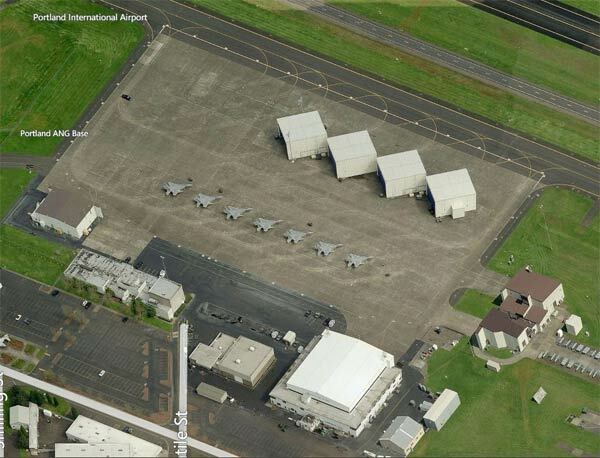 These F-15’s fly out of the Portland International Airport, also known as PDX, which is famous for it’s ugly carpet. PDX houses an Air National Guard Base(history), aka ANGB. This base is home to the 142nd Fighter Wing(history). Difference between the F-15C Eagle and F-15E Strike Eagle? The C is a single seater built for maneuverability and air superiority while the E Strike Eagle is a double seater built to carry bombs and strike ground targets. What branch of the military flies in Portland? They are not under control of the United States Air Force like a standard F-15 Fighter Wing but instead are a “state militia” squadron. They are commanded by the State of Oregon Air National Guard. Unless of course an order is given by the President of the United States. In that situation, they return to the standard USAF Air Combat Command Unit. Why do they always fly F-15’s in Portland? They are on alert! They are part of the Pacific Theater Aerospace Control Alert (ACA) here in the Pacific Northwest, and they provide ACA 24 hours a day, 7 days a week for the entire region from Northern California to British Columbia. They’re basically part of NORAD (North American Air Defense). I’m surprised we don’t hear them more. They defend the whole upper West coast from the boogeyman all year long. What about the black helicopters over Portland? Now you’re just paranoid. There is no such thing. Move along. Okay, I lied. PDX’s Air National Guard base also houses the 304th Rescue Squadron and they fly black helicopters over Portland. They look like Black Hawks but are actually “Pave Hawks“. These guys played a huge role in rescue operations after Mount St. Helens blew in 1980. Other Military Aircraft Out of Portland? It’s not all F-15 Eagles here at PDX. You will occasionally see other jets, airplanes, cargo carriers and such flying in and out during routine military exercises and local airshows. Unfortunately, I was unable to determine how many units are in this squad but here is an aerial photo showing 7 planes. Google satellite shows 8. We can assume at least one or 2 is out at all times. It’s too bad you actually hear them a lot more than you see them because of all the cloud cover and rain in the fall and winter, but they are out there! 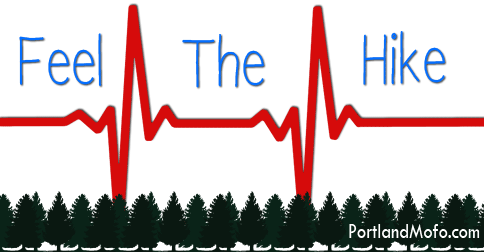 As always, please share and subscribe for more Portland! You can follow Portland’s 142nd on Facebook. Please check out our Day Hike Equipment Guide. Just a historical addenda; prior to the F-15s, our guys drove F-4s. There was a restructuring of air defense tasking with a significant reduction in billets & aircraft, so….units if they wanted to survive had to compete for their jobs. A tournament was created to test each units flying & maintenance skills. Our guys beat a whole bunch of other units. Maybe it’s because Portland/Oregon appeared rather unassuming to the national brass cause they were quite impressed. Most of those men & women are retired now, but they deserve kudos and our gratitude. The RedHawks truly earned their wings, I love seeing and hearing(!) them. I know they are loud, but it’s a price we should all be willing to pay. I agree! It used to happen only twice a day where the planes(usually 3 or 4) would leave Portland, do their patrol & come back 6 hours later. Now it goes on constantly. Our tax dollars at work! This constant taking off and landing is pure b.s. I live here and have been, long before they started this agenda and there are a lot of neighbors here that abhor the freaking noise they generate. As far as I’m concerned it’s just the same ole little boys war toys thing. It’s no wonder we don’t have any money to take care of the real threats that we face here in the Americas and across the globe. Oh yeah, I had some bonehead tell me that there’s airspace incursion! OOOOHHHH! The Russians are coming. Please, I lived through the 50’s when there was always supposed to be a Russian living under every bed. And we know what a load of crap that was. My big question is when did we become such a bunch of lily-livered cowards. Or is it that we are willing to be conned into thinking whatever the moneymakers want us to think? I love them!! Always have, always will!! They send tingles down my spine, and I tear with gratitude as they roar!! God bless them!! Remember 9/11?? I was thrilled to hear the jets after three-four days of eerie silence, nervousness and lack of sleep due to worry. I live in Gresham on the landing (and sometime takeoff) flight path. I will take the roar anytime because it reminds me someone is out there protecting ME. Yes, sometimes it is overwhelmingly loud, but silence is not a good offset. I love them. They fly by my place and get quite low for the veterans cemetery services. Yes! Today I saw three WWI biplanes totally redone. It’s my bday and that’s what I needed to hear and see. Woo hoo! I I love history. Good article and comments people awesome! Also, PDX will also have U.S. Navy and Marine Corps F/A-18 C/D,s and E/F “Super Hornets” fairly regularly too. Not to mention, F-35 Lightening II’s. PDX is one of the busiest mixed use (military/civilian) airports in the US. I read this article and it was spot on and very informative, however some folks on here did not understand the importance of having the F15 alerts. This fighter squadron provide ACA 24 hours a day, 7 days a week for the entire region from Northern California to British Columbia. Ok let me translate that: they police air space. For example in this article, July 4th Russian bear bombers we’re escorted by F15 50 miles from the California coast. This is one of few examples that actually makes it to the news. They do a lot that we never hear about. 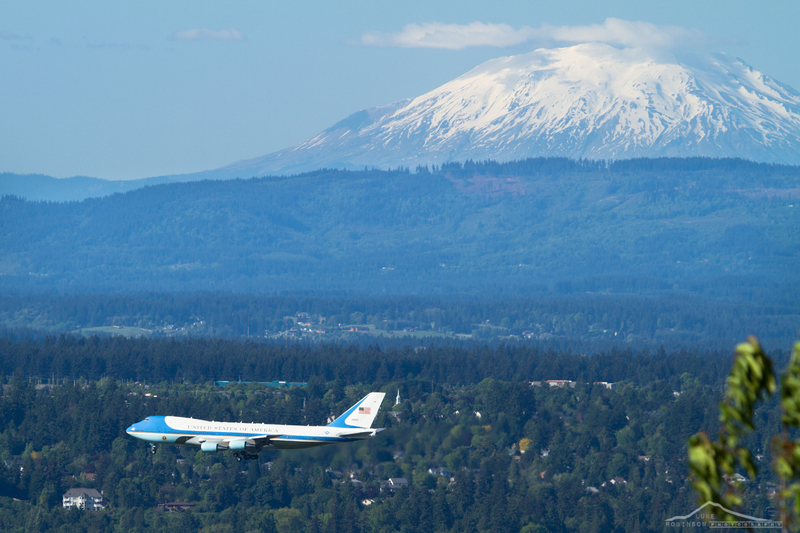 Well you might ask; well why are they flying over Portland? Two reasons: again if you read the article they are based out of the Portland airport, and second reason is they have to practice to be good at what they do. You don’t expect a fireman or a cop to be an expert with out practice? Of course not. Same here they have to fly to protect us when we need them. I personally do not care for the noise myself, but when I hear it I know I am protected. Just like a cop cars or ambulance sirens. They are good people that do great job taking care of us. Thank you. Hey, can you specify OREGON here somewhere ? I was so excited that Maine had a fighter squadron, then I found out it’s just the other Portland…. BTW, this is AFTER I saw three fighter jets in the corridor for a Bangor landing today. I miss the sonic BOOMS from back in 70’s… Awesome. Scare the crap outta you when you’re a kid daydreaming in the backyard. Good times. Also cool watching F15 take off. Turbo boost! This is America, if you don’t like the noise move! I’ve never met a combat veteran that would complain about the sound of a jet fighter over head. To me it is the sound of SAFETY….. I know they are doing their job when they are in the air. Thank you Military. I live North of Kingsley Field. I live in Vancouver, I hear these jets all day everyday. They shake my house they are so loud. Please just stop, I feel safer without the jets over my head. So annoying. Evening – I’m new to Portland and live near PDX, I get to see them fly nearly everyday. I’ll never tire of seeing, and hearing them. They’re a bit louder but nothing horrible. Thanks for the article, I’ve been trying to figure out where they were coming from. Three days a year, the Portland-Hillsboro Airport hosts the Oregon International Airshow. This year it was in September. The loud jets were a flyby part of the Airshow. Nothing to worry about. Yeah, sure there is a slight increase on those few days but the majority of the jets year round are the F-15 Redhawks out of PDX. Hillsboro, Oregon had a very low fly by today. It was too loud. I lived at Alameda NAS back in the 80’s… Jets doing touch/go’s were an everyday thrill! The Blue Angels were regular guests! There was a picnic beach on the bay side of the runways… We’d spend hours there. Alas… the base is decommissioned now, but the Memories! But yeah, Alameda Naval Air Station has been shut down for a long long time. The Blue Angles still come and fly out of the Oakland Airport though for Fleet Week. The jets were black and they were staph jets meaning they were going somewhere and not for fun. Those Eagle drivers don’t ‘buzz’ any part of Portland. It is not an air range. Last time one did was 9/11/2001. They might do a fly-by for an event but the restrictions are pretty darn tight. A few times a month they might use afterburner for take off @ PDX. Cool to see. The vertical gate climb is still one of my favorite and I have been working on the Eagle since 1991. We have the F-15C Eagle in PDX. 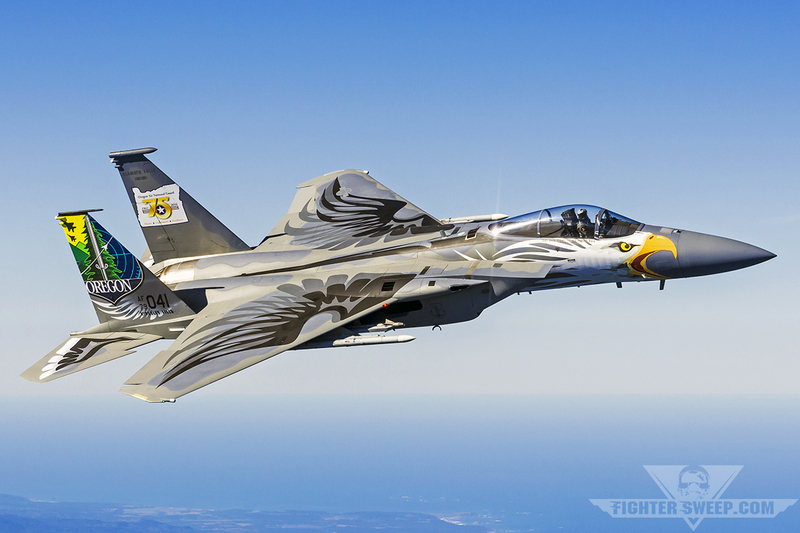 The Strike Eagle is F-15E, it looks similar in shape but is painted different and outfitted for carrying bombs. The ones here are designed solely for air superiority. As with most pilots, proficiency is key so a most of the flying is for training to be effective in a combat situation. Which is important since the mission is as you said ACA which is homeland defense under the direction of NORAD. Thanks for that info. Removed the word Strike. I always thought all Eagles were called Strike Eagles. Great article. Thank you for trying to shed some light on the mission and people of the 142d Fighter Wing, and the Oregon Air National Guard. The aircraft are indeed F-15s in C (single seat) and D (two-seat) variants, but they are not “Strike Eagles.” Strike Eagles are F-15Es and are exclusively two-seated aircraft. Military authority for the National Guard is somewhat of a multi-headed beast. Every National Guard unit is ultimately commanded by the governor of their respective state. There is a general (official title is The Adutant General) who is the military commander of both Army and Air Guard units in their state. Then the Army/Air Guard have their own chains of command. Each National Guard unit also answers to the National Guard Bureau (NGB). The Chief of the National Guard Bureau only recently got a chair position with the Joint Chiefs of Staff at the Pentagon. In the case of the 142FW, they also fall under the US Air Force’s Air Combat Command (ACC) Major Command (MAJCOM). The National Guard (Army or Air) can also be federally activated, which would then give the President authority over forces. However, in the case of the ACA mission, those pilots must be under federal (not state) authority to perform their mission. 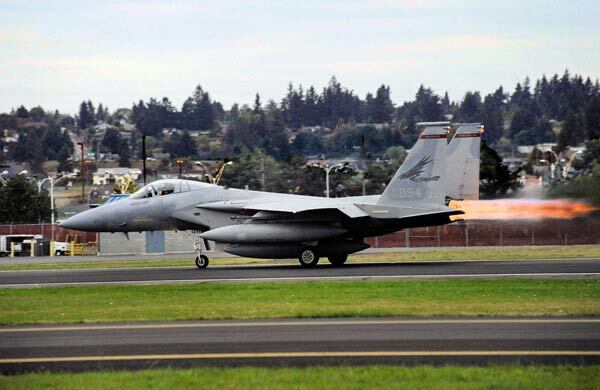 The alert aircraft respond to threats communicated by NORAD (more specifically by the Western Air Defense Sector, or WADS, located at Joint Base Lewis-McChord near Tacoma). The pilot killed in the training accident 10 years ago was Major Greg “Grumpy” Young. The 173d Fighter Wing at Klamath Falls is an Oregon Air National Guard unit. As a training unit, they fall under the USAF Air Education and Training Command (AETC) MAJCOM. Thanks! Your information was very helpful and I have updated the article to reflect it. The 304 RQ is still at PDX, but doesn’t have aircraft anymore. AFAIK, they are all Blackhawks, not PaveHawks. Why would the 304 rescue squadron have black hawks if they are a rescue squadron? And I thought they were based at PDX not Salem. Trying to understand all the Portland military activity. Thanks for understanding. The HH-60G Pave Hawk is an Air Force specific version of the Blackhawk helicopter with significant modifications for the combat rescue role and it is generally regarded as the most advanced version of the aircraft. The 304th is a Air Force Reserve unit operating out of a PORTLAND ANG Base. (PDX). The Blackhawks are from Salem. I have paid all my adult taxes in Oregon but grew up in San Diego. You get used to the jets. They are loud but they are pretty badass and when they do vertical take offs at the Airport, I am a 9 year old screaming for joy. 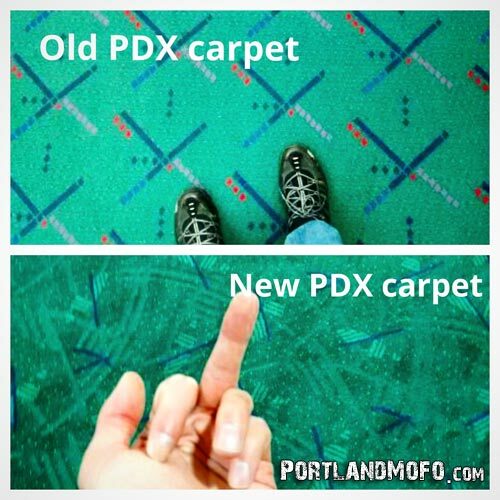 I worked at PDX. The big thing is there isn’t any sonic booms. I remember when off the coast one pilot was to eager and destroyed like 1000 windows. But they are not going anywhere. When you hear them, feel safe. The vertical take-offs are called “jet climbs” — rarely allowed because of restrictions in city limits. Hair-raising and awesome, no matter how many times you witness them. Why are the jets so common? They give me a headache. They fly so low and loud. Because they are protecting you, Donna. Oh ya? They really give you headaches. Please. I worked in the Bay Area and lived in Santa Cruz for 25 years before moving here about 10 years ago. Used to see C5s and U2s fly into Moffett a few times a year, as well as the occasional Orion and fighter jet. Not to mention watching pararescue practice in Monterrey Bay off of Santa Cruz. Having been born and raised on Navy Air bases, I find the sounds of the military going about their daily jobs familiar and comforting. I used to love going to the Moffett Airshow growing up. I was even at the Last Airshow in 1994. Hardly, I grew up as an “Air Force Brat LIVING on AIR FORCE BASES, and the Jets were barely noticeable. I think what we have HERE from these Weekend Warrior posers is fellas who watched “Top Gun” just one too many times. Some of these jets fly SE over the Happy Valley area every Tuesday and Thursday, mid morning. I believe it used to be just Thursdays. Today, 9 Aug16 at 10:15 am, the jets were super loud, almost like they roared so loud and then the sound was just gone. I’ve never heard them this loud before. Can you explain that? I couldn’t really tell you but sometimes they do steep climbs and in that case they would be much louder and you would hear them for a lot longer as they are staying in your direct vicinity while climbing up instead of blasting over and out of ear range in less than 30 seconds. Hey- Thanks for the explanation! I am also from the Bay (SF) & we’re used to only hearing the Blue Angels in October so I was a little rattled to hear these fighter jets in my quiet hood in Portland. Also, kudos to your reply to that extremely childish comment from ‘statesfull’ who is clearly a victim of PDX’s public schools lead contaminated ‘drinking water’. Yes, I am from Oakland, born and raised. I live here now. Our city. But since I refuse to share with people like you, MY city. But don’t worry, I allowed countless people who were born in Portland to move into my old birth city of Oakland. It’s been an even trade. Get used to it. It’s the way of the road Rick. Times have changed, internet exist, people move and we were an earth roaming species to begin with. I live in north Portland and one of them flew so low it made my car alarm go off. They are loud and annoying. I am a military veteran. I don’t see the point of buzzing peoples homes and damaging their hearing. They don’t do anything unless it’s necessary. 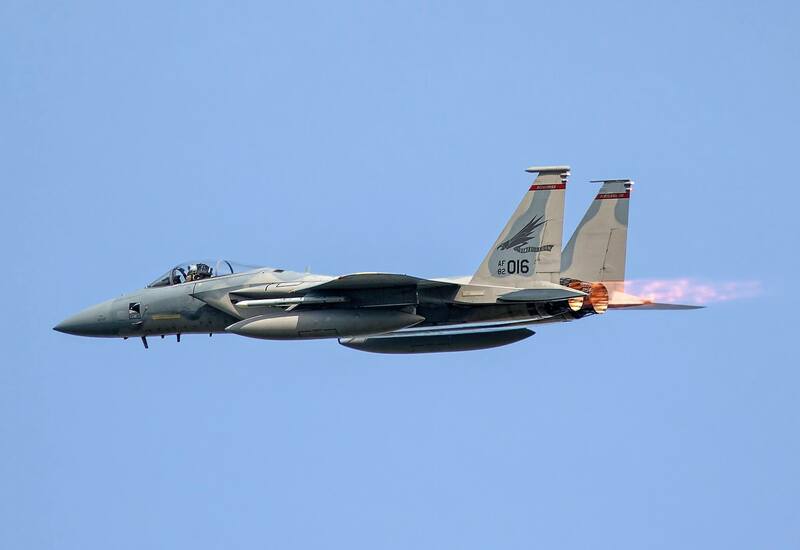 You don’t get to be an F-15 pilot if you’re the kind of person who buzzes anything. Only the best of the best get to be Eagle drivers. And there’s lots of guys who want their seat the last thing you’re going to do is jeopardize it by doing something stupid. But you’re right they can be loud and seem a little obnoxious. But we’re lucky we can cover the entire Pacific Northwest from Canada to Northern California all the way to Idaho with a fleet of less than a dozen airplanes. If you lived near Military Base in Russia…… ugh. THAT would be uncomfortable at best. Funny, my family moved to the northwest from San Jose in ’72. You sound like you could be my cousin! Except he lives in…..wait for it…..Black Hawk! Black Hawk! No, unfortunately I’ve only ever been able to visit Black Hawk, not live there. My mom moved from Oakland to San Jose about 5 years ago though. I have lived near airports most of my life. Just heard one of your planes. It seems like they take of and circle then land again. I don’t think of it as security. Just annoying.